"How will the value of your days be measured?" 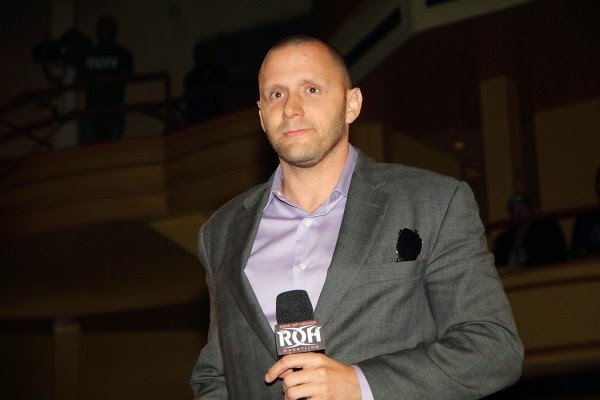 Nigel McGuinness, an eloquent and soft-spoken man, makes a mockery of the out-dated stereotypes of professional wrestlers as jacked up, lunk-headed monsters with The Last of McGuinness - an impressively nuanced and touchingly introspective documentary the Englishman wrote, directed, produced and edited. Chronicling his farewell to the squared circle, McGuinness looks back on a career in which he didn't quite live up to the hopes and dreams he had as a child - to make it as a superstar in the biggest sports entertainment company on the planet: World Wrestling Entertainment. Despite being critically acclaimed as one of the greatest professional wrestlers of his generation, and fighting for an array of federations all over the world, McGuinness' career path never led him to the biggest stage of all. Fellow wrestler GQ Status questions him with telling insight: "You feel like one of those guys who landed on the moon but didn't get to walk on it?" The devastating and depressing movie pits us a question which Hollywood never would - what if you had an all-consuming dream and gave everything you had to make it come true... and it simply wasn't enough? McGuinness reflects on a life spent brutalising his body, giving all both mentally and physically, and coming up short - this film represents his battle to find serenity and accept the things he cannot change, and the wisdom to understand what, if anything, all the sacrifices he has made, have been for. The dreams McGuiness had as a twelve year old are at odds with his real adult life - a part-time job in a grocery store to supplement his income and a career spent making friends industry in which premature deaths abound. "I hope that some day some of this, all of this makes sense.... because right now it doesn't." Delivered as an elongated eulogy, much of The Last of McGuinness feels like one of the most incredibly depressing road movies ever made - the star films himself travelling from venue to venue on a retirement tour, delivering monologues on how his life has not panned out the way he would have hoped. It is testament to the likability of our hero that this never comes across as self indulgent or entitled; there is a graceful eloquence in his voice and choice of words which act as empathetic aids for the audience. Our heart sinks as we hear of bad fortunes, situations which McGuinness could not control, which thwart his ambitions. For a first time feature, The Last of McGuinness is a remarkable achievement. He didn't have the biggest budget, the benefit of film school or years of experience, but Nigel McGuiness has heart - and that's what makes the documentary such a success. It connects with us on an emotional level due to the sincere intensity and an understanding of storytelling McGuinness honed in squared circles across the globe. A black and white sequence of McGuinness matching up against Tyler Black is euphoric - our subject narrates over the footage of jaw-dropping violent acrobatics with words of gentle poetry; of the energy, of the alchemy of two bodies in perfect synchronization, of the total immersion into character and story, of the thrill of live action which can make us gasp in earnest. It is the cinema of heightened sensation; the cinema of awe and beauty. McGuinness too fantastically portrays the kindred spirits the industry brings together and the bond they form - a camaraderie based on trust and understanding, respect and "the things you share with these people... the memories... the experiences.... the passion". Yet, what makes this a truly remarkable film is, not so much what the wrestler teaches us, but what he learns on his journey. A young boy, not of dissimilar age to McGuinness when he first fell in love with the sport, asks a masked grappler known as Shark Boy if being a wrestler is "the coolest thing ever". "No," is the simple reply. "Being you Dad is the coolest thing ever." And, if McGuinness questions the mark he made on the world, it soon becomes clear that not only does he have the hard-earned respect of his peers but that there are plenty of other teenage boys and girls who admire him too - many of whom may be the McGuinness of tomorrow. Whilst McGuiness may not consider his wrestling career a success, his film is an unquestionable, unparalleled one (although I would note that this would be best enjoyed with some understanding of wrestling). A joy and a triumph, an inspiration to the would-be sports entertainers of the world, and an inspiration, equally, to all the story-tellers. As a final note - McGuinness is currently fund-raising for a new project - LA Fights - via Kickstarter.